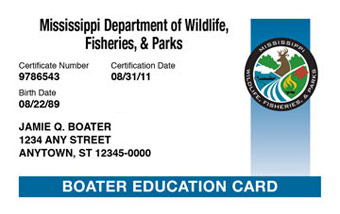 If your Mississippi Boater Education Card is lost or damaged, you can contact BOATERexam.com® to get a replacement card. Your address at the time you took the online boating safety course. Faulty boater education cards will be replaced at no charge (you must return the faulty card). Lost or damaged cards will be replaced for a fee of $9.95, including shipping. Please note- we can only issue replacement cards if you took your Boating Safety Course at BOATERexam.com®. Boating License or Boater Education Card... is there a difference? The boater education card is proof that you have successfully completed a boating safety course. The boater education card does not expire and does not need to be renewed. Therefore, it is NOT a Mississippi Boating License!